Community Coffee Company is the largest family-owned and operated coffee company in the U.S. Community offers high-quality blends featuring 100% select Arabica coffee beans in a variety of yummy flavors such as Pecan Praline, French Vanilla, and classic Dark Roast. Southern Bread Pudding - All the flavor of the traditional Southern dessert–brown sugar, caramel and a hint of honey-coated raisins. Expertly balanced with incredibly smooth flavor. Made from only the top 10% of the world's coffee beans. Pumpkin Praline - With delicious hints of pumpkin spice and toasted pecans, this satisfying medium roasted coffee is a seasonal favorite. Made from only the top 10% of the world's coffee beans. French Roast - Their darkest roast yet. They use only the top 10% of the world's coffee beans for a robust flavor and a remarkably rich finish. This is a great smooth roast not at all bitter. It is the perfect jolt to get you going in the morning! Each variety of Community Coffee is guaranteed to awaken your senses and leave you feeling refreshed. Plus, most flavors are available in ground, whole bean, and single-serve cups, so that making coffee is as simple as can be whether it’s for you or to share! Did you know when you used in recipes, coffee can flavor and tenderize, add complexity, and enhance other ingredients. For savory meals, use Community coffee in combination with other herbs and spices to marinate meats. For sweeter treats, try coffee in pudding, cake and cupcake and brownie recipes to intensify the flavor of chocolate. Heat the oven to 350F. Line cupcake pans with paper liners. Cream the butter and sugar for 2-3 minutes until light and fluffy. Add the eggs, one at a time, beating well. In a separate bowl sift together the flour, cocoa and baking powder. Add the flour mixture alternately with the cold coffee to the creamed butter. Pipe on frosting. Sprinkle mini chocolate chips on top of cupcakes. 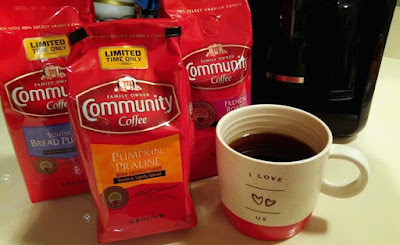 Community Coffee gives back in a variety of ways. One such way is their Military Match Program. Over a decade ago, Community Coffee began supporting our military personnel by shipping pallets of coffee overseas. Over the past five years, they have been thanking the men and women in the U.S. Military by doubling customer coffee orders for free through the Military Match program. This past year, Community Coffee Company reached a new landmark with more than 20,000 pounds of coffee shipped to overseas military personnel since the program’s inception. BUY 4 Buy your favorite Military Match Set of four 12 oz, 16 oz, or Single-Serve 18 ct coffees. They will match your purchase with an additional four items, and send all eight items to the APO/FPO or military base address you provide. They will even include their Signature Military Mug with your shipment.